Hello, my name is Christina aka CatleenCosplay. I am cosplayer from Budapest (Hungary), but now living in Germany. 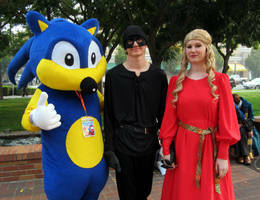 I have been cosplaying since 2011 and love making costumes, especially from videogames, movies, cartoons and tv series. Over the last few years I have made more than 100 costumes, most of them are from badass female characters. My skills are crafting, painting and sewint, and I try to learn everything from photograpy and editing. I am interesting in tv shows and movies, all animals around the globe, writing, and gaming. This website is my Cosplay portfolio portal. You can view my cosplayes and soon you can find a few samples from my photography works. And you can abel to buy from me digital blueprints, coscards, posters and in the fruture some of my cosplay works. CatleenCosplay has started a donation pool! thanks for the favorites on my RWBY cosplay. have a watch and Llama! Thank you for the fave on my Snow White cosplay!